ISLAMABAD, Pakistan (Thomson Reuters Foundation) – Zulekhan Mumtaz has seen her livelihood as a seller of camel milk turn sour because of a brutal heat wave that left Pakistan sweltering for three weeks in May with temperatures up to 51 degrees Celsius. “My customers say they can no longer buy spoilt milk and squander their money,” the 31-year-old said, looking at the clotted yellow liquid. “How can I buy fodder for the camel and food for my two children if the heat wave damages my milk?” she asked, resting with her animal in the shade of a tree in an upscale residential neighbourhood of Islamabad. Pakistan in recent weeks has suffered its most severe heat wave in decades, with temperatures reaching as high as 51 degrees Celsius (124 Farenheit) on May 19 in Larkana, a city of two million people in southern Sindh province. This was the highest temperature for that month recorded there since 1998, when the mercury had peaked at almost 53 Celsius (127 Fahrenheit). Lahore, Punjab province’s capital of about 15 million population, was the hottest city in the country on May 24 at 47.4 Celsius (117 Fahrenheit), hotter than any May since 1954. Such extreme temperatures – which are becoming more common as a result of climate change – are an enormous health threat. They also make almost every function of daily life a nearly intolerable struggle – including, for millions, trying to earn a daily living. The camel milk vendor Mumtaz, who lives in a shanty village on the outskirts of Pakistan’s capital, walks about four miles (6.5 km) daily to set up her roadside stall. Most of her customers are diabetes patients, among whom camel milk is very popular because it is a good source of insulin to help deal with the illness. But “the heat wave has eroded my livelihood and made my camel sick because of frequent dehydration,” Mumtaz said, adding that the animal’s milk capacity had dropped by 70 percent. She sees her only remaining option as leaving the capital to return to her ancestral village. Other livestock owners in Chak Shahzad, an area on the edge of the city popular with cattle farmers, report similar problems. In the final week of May, Jamal Khan sold all 19 of his buffalos to a slaughterhouse in the city for about 2.1 million Pakistani rupees ($21,000), because his herd’s daily milk production had declined by 60 percent. “I had no choice but to sell them, for fear of suffering heavy losses if they die of hyperthermia or repeated bouts of dehydration,” Khan said. Deaths have not been limited to animals. Although officially confirmed figures of heat-related deaths are not available, local newspapers in Pakistan reported over a hundred deaths since early May. Residents in most cities, towns and villages have been forced to stay indoors, leaving typically bustling shopping areas and business centres closed, and roads and highways deserted between 10 a.m. and 6 p.m.
Left with limited options to cope with the heat, people have increased their consumption of cold beverages and fresh juices to try beat the sizzling heat and avoid dehydration and heat stroke. Government hospitals across the country remained on emergency alert throughout much of the last month because of the heat wave. “We have been advising the visiting patients (to increase) consumption of fresh water, juices, fruits and vegetables”, said Altaf Hussain, executive director of the Pakistan Institute of Medical Sciences Hospital in Islamabad. On May 27, rainfall finally brought a significant drop in temperatures to below 38 Celsius (100 Fahrenheit) in the Pakistani provinces of Khyber-Pakhtunkhuwa, Gilgit-Baltistan, Punjab and Balochistan. But the Pakistan Meteorological Department (PMD) predicted dry and very hot weather across the plains of Sindh province, in the south of the country, for the first week of June. Temperatures in Islamabad have rebounded by 10 degrees to 40 Celsius (104 Fahrenheit) since the end of the month. According to a meteorological department advisory, the heat wave is unlikely to completely loosen its grip until the beginning of the first monsoon rains, expected in the first week of July. Qamar-uz-Zaman, vice president for the Asia region at the World Meteorological Department, said that extreme summer temperatures, which have become common during the last few years in Pakistan, can largely be attributed to climatic warming. Data gleaned last year from 56 meteorological stations throughout Pakistan show a marked increase over recent years in the frequency of heat waves and rising temperatures particularly in the southern plains and coastal areas, according to Ghulam Rasul, a senior weather scientist at the meteorological department. Reports of severe damage to cotton crops and paddy rice nurseries have come from around the country. 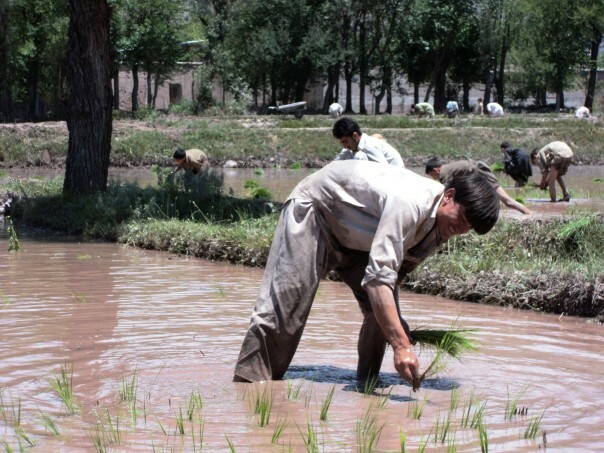 Ibrahim Mughal, chair of Agri Forum Pakistan, said in a phone interview that the heat wave had struck when cotton and rice sowing were at their peak. “Farmers will have to quickly re-sow their cotton and paddy crops to avoid further harvest losses,” Mughal said. Pervaiz Amir, an agro-economist and member of the government’s Task Force on Climate Change, said that the heat wave increased the evaporation rate by 20 to 25 percent compared to normal summers. He advised farmers to irrigate their crops more frequently, at least once or twice a week, and to adjust the timing of irrigation to early mornings and late evenings. He also urged planting of shade and fruit trees along water channels, to cut evaporation of water. Pakistan’s Environment Protection Agency warned that people in urban areas are at greater health risk from heat waves than those in rural parts of the country, in part because urban areas often absorb more heat. Saleem Shaikh is climate change and development correspondent based in Islamabad.